Glass Canopy [20 * 10] - Actual Size 19 1/4 in. * 9 1/2 in. 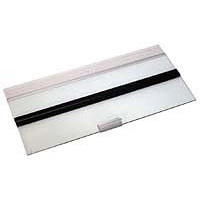 Glass Canopy [24 * 12] - Actual Size 23 1/4 in. * 11 1/2 in. Glass Canopy [30 * 12] - Actual Size 29 1/8 in. * 11 7/8 in. 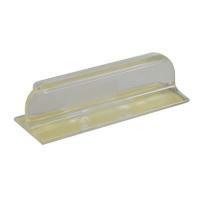 Glass Canopy [36 * 12] - Actual Size 35 1/4 in. * 11 1/2 in. Glass Canopy [36 * 18] - Actual Size indicated below. Glass Canopy [48 * 13] - Actual Size indicated below. This handle is no longer a clip on type, it is fastened to the glass canopy by adhesive. New image to follow.